Update: After weeks of rumors and denials, following a supervisory board meeting, Deutsche Bank has confirmed that John Cryan and Marcus Schenk are to leave the bank and Christian Sewing is the new CEO. The Supervisory Board of Deutsche Bank has appointed Christian Sewing as Chief Executive Officer with immediate effect. He succeeds John Cryan who will leave the bank at the end of this month. Additionally, the Supervisory Board has appointed Management Board members Garth Ritchie and Karl von Rohr as new Presidents. Sewing, born in 1970, has been a member of the Management Board since January 1, 2015. He was appointed as President in March 2017. Most recently he was responsible for Deutsche Bank’s Private & Commercial Bank (including Postbank) together with Frank Strauß. He was Head of Group Audit from June 2013 to February 2015, prior to which he held a number of management positions in Risk. Since joining in 1989 Sewing has worked for Deutsche Bank in Frankfurt, Hamburg, London, Singapore, Tokyo and Toronto. From 2005 until 2007, Sewing was a member of the Management Board of Deutsche Genossenschafts-Hypothekenbank. Before graduating with a diploma from the Bankakademie Bielefeld and Hamburg, he completed a bank apprenticeship at Deutsche Bank. Deutsche Bank’s Corporate & Investment Bank will be led by Ritchie who was previously Co-Head of the division with Schenck. The Private & Commercial Bank will be led by Strauß who was previously its Co-Head along with Sewing. But, as Bloomberg notes, this isn’t a victory for shareholders yet. Reviving Deutsche Bank still requires even deeper cuts to staff and pay, upgrades to its creaky technology, and hard decisions on which businesses to let go -- particularly in the U.S. All of these come at a cost -- profits and prestige will probably take a further hit. If Cryan couldn’t pull this off, how can Sewing? The response is likely more Deutsche, less Bank. Reducing its global footprint seems pretty much inevitable. A smaller U.S. presence is on the cards, and prioritizing Germany and Europe will no doubt keep stakeholders like the government and voters happy. Plans to ramp up lending to small- and mid-sized companies, while pruning the number of bank branches, should hopefully improve the commercial bank’s returns. The question is - what happens next? Will Sewing choose to kitchen-sink all the skeletons in the closet? 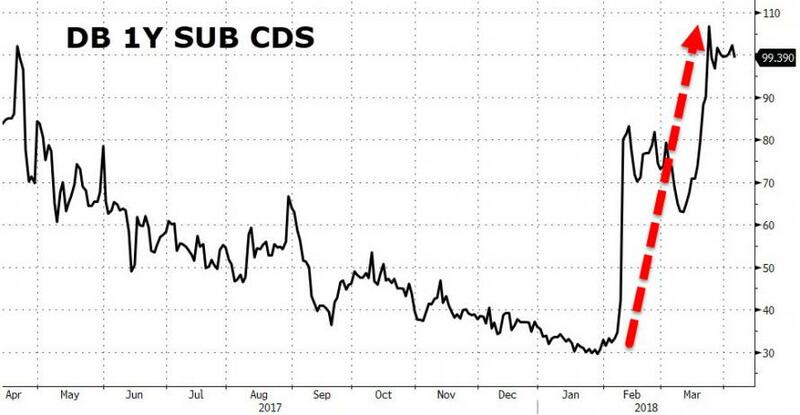 Just a gentle reminder, Deutsche Bank is among the world's most systemically dangerous banks to the global financial system, and with a retail banking head running an institution that sits on top of EUR 48 trillion (US$60 trillion) notional of derivatives exposure, we hope he doesn't 'scalpel' the wrong guy from risk management. As we detailed earlier, it's been barely two weeks since the Wall Street rumor mill first reported that Deutsche Bank's John Cryan, the CEO of Germany's largest (and most troubled) lender, was on the verge of being pushed out. And if the latest update on the situation, reported this weekend by the Wall Street Journal, turns out to be accurate, DB's investment banking staff might want to start updating their resumes. After soliciting a handful of outside candidates including a top Goldman banker, DB is turning inward once again. To wit, the bank's preferred candidate appears to be retail banking chief Christian Sewing, a German who has spent his entire career at the company. According to WSJ, the company's supervisory board is contemplating the dismissal of Cryan, a former investment banker, and Marcus Schenck, the co-head of DB's investment bank and co-president of Deutsche (along with Sewing), who recently informed the board of his intention to leave after struggling with regulatory constraints that he feels are hampering his ability to do the job he was hired to do. Garth Ritchie, the co-head of DB's investment bank, is also reportedly on the way out. Deutsche Bank AG’s supervisory board is favoring retail-banking chief Christian Sewing, a German who has spent his entire career at the lender, as its next chief executive officer to replace John Cryan, according to people familiar with the matter. The supervisory board plans to hold a conference call Sunday evening to discuss Mr. Sewing and an external CEO candidate, but is already inclined to support Mr. Sewing, one of the people said. No decision is final, they said. The supervisory board also will discuss the planned departure of Marcus Schenck, co-head of the investment bank and co-president of Deutsche Bank with Mr. Sewing, people close to the bank said. The Wall Street Journal reported Saturday that Mr. Schenck has been in discussions to leave. His departure plans were being finalized Sunday, one of the people said. Garth Ritchie, the other investment-bank co-head who oversees global trading operations, also has had discussions about possibly leaving as early as this year, the Journal reported earlier this week. But those discussions shifted going into the weekend. Mr. Ritchie now could assume broader investment-banking duties in light of Mr. Schenck’s planned departure, according to people familiar with negotiations that continued into the weekend. That could mean Mr. Ritchie becomes sole head of the investment bank, they said. No decision is final, with details still being discussed Sunday, one of the people said. That the bank's supervisory board is contemplating shifting the balance of power to DB's retail operation is hardly a surprise. DB's investment bank has struggled despite several rounds of staff cutbacks. Most recently, it warned last month that it would take a hit from an appreciating euro and rising funding costs. 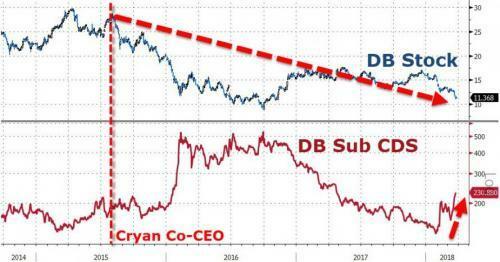 The fact that DB's shares have sunk 60% since Cryan took over also hasn't helped to engender good will. A focus on retail would presumably help the bank take in more customer deposits to shore up its increasingly shaky balance sheet. 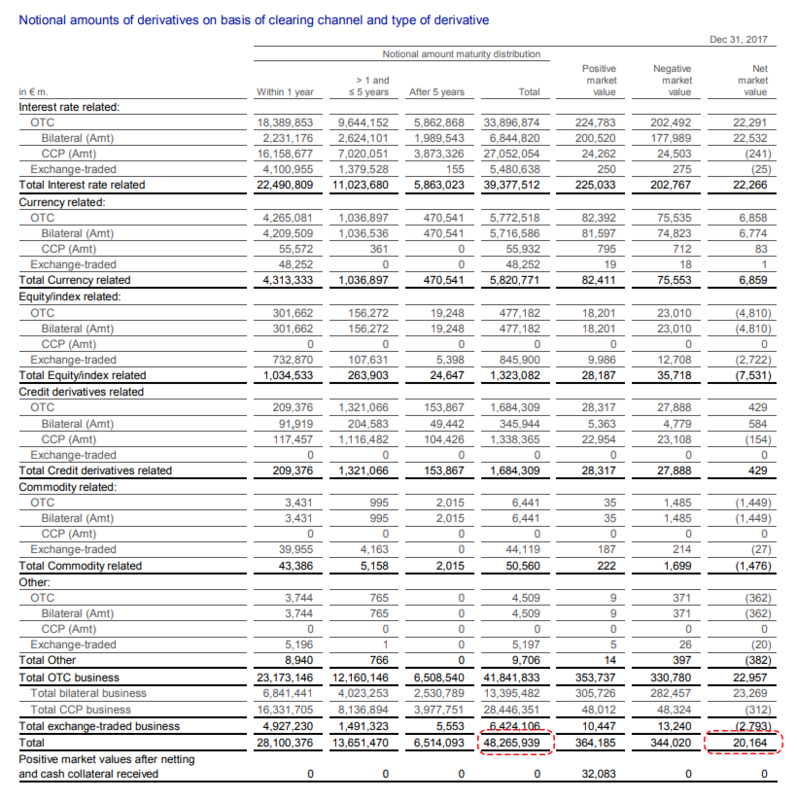 DB has struggled to raise cash to shore up its troubled balance sheet. The lender has undertaken three fund raises in the past eight years, raising nearly 27 billion euros total. Last month, the bank spun off its asset management business via a stock market flotation, raising roughly 1.4 billion euros. Sewing's history with DB dates back to when he completed an apprenticeship at the bank as a teenager. His appointment would be a sign that DB intends to shift its focus back to its domestic market, and focus on lending to European companies over deals and trading. After serving on the supervisory board for two years, Cryan, a Briton, became co-CEO in mid-2015 and sole CEO a year later. But he has failed to return the bank to profitability. Recently, troubled Chinese conglomerate HNA sold part of its stake in the German lender - a chunk equivalent to 1.1% of the bank's total float. That provoked a liquidity panic that sent shares back toward their post-crisis lows.